The devastation that floodwaters can cause in a family home can really only be fully understood with first-hand experience. In recent years many families in the USA have experienced a flooded home – and some families have been hit with multiple floods. One recent example from May 2018 is Ellicott City, which had a devastating flood for the second time in two years. Rebuilding from scratch was the only option after horrendous fires and hurricanes that swept the nation in 2017 resulted in completely destroyed property. However, floods often leave us in a unique dilemma. A flooded house still stands, though when the water recedes, owners are faced with an un-liveable house that has a multitude of serious problems, including toxic mold and extensive damage to the interior and exterior structure. I’m excited to share details about a refurbishment methodology built on science and practical knowledge that provides a way to build a flood resistant home. The program focuses on how to re-construct a building using technologies that prevent or minimize floodwater entering the building – as well as measures that can be incorporated into the building fabric, fixtures, and fittings that can be installed to reduce the consequences of flood water impacts after floods enter a building. Welcome to the Building Centre for Resilience (BRE). 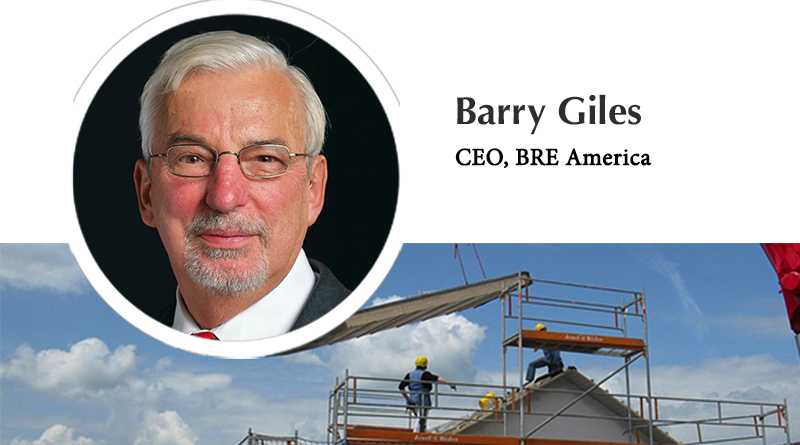 The BRE is a global non-profit dedicated to advancing the knowledge in the built environment. For the last 97 years, the BRE has funded building research used to create standards and provide practical solutions and data for the building industry. Today, it is leading the way to changing how we build for a resilient future. Let’s look at the most important step when flooding is imminent – preventing water from entering the building. It’s possible that using solid construction walls designed and built to withstand two feet of water, and installing doors and windows equipped with seals and secure locking, could be all that is needed to prevent damage during a flood event. It’s not rocket science. Doors and windows are already made with locking mechanisms that secure the door, so if you add seals between the frame and door, suddenly there’s a way to stop the flood water entering in the first place! The next steps include adding non-return valves on toilets and other drainage systems to prevent back flushing into a house. Doing more can get a little more complicated, which is why the BRE has a testing facility at their Watford, England campus, where they built a flood resilient house. At the BRE Innovation Park, they started with the premise that the building WILL get wet, so they looked at the best method to remove flood waters quickly. They refurbished the property with materials that are water resistant or shed water quickly without long-term damage. Sheetrock and insulation are difficult to dry out, and most types of insulation seem to hold water, which allows quick growing mold on the internal timber components. While the water level may only reach a foot or so, floodwaters can quickly leech upwards four or five feet. This not only causes more internal harm, but also creates a hazard with electricity as the water gets into wall sockets and other electrical equipment. BRE created a prototype flood resilient home by replacing sheetrock with waterproof magnesium oxide wallboard, creating a French drain around the inner walls, replacing carpets with ceramic tiles, providing a centre sump pump, and raising wall sockets to three and four feet in height (and powering this downwards from the ceiling), along with other standard go-to ideas. And BRE was so sure it would work, they got the local fire crew to fill the house up with water to prove it worked! You can see photos of the flooded house online. Are these ideas revolutionary? No, not really. Are these refurbishments going to cost more? Yes, but homeowners in Ellicott might be back in their homes already if they’d followed the standards described by BRE. The Property Flood Resistant Plan from BRE provides plenty of scientific-based information about flood resiliency. Although based out of Europe, this comprehensive document provides a path forward that homes in America should start following for protection from the next extreme weather event. Our homes are supposed to be our “castles,” and we should treat them as such. Thankfully we don’t need to build high walls and moats around neighborhoods to protect American homes, but we do need to rethink how to build and protect our homes. We can easily avoid the devastation we’ve been seeing all too frequently in the news from places like Ellicott City, New Orleans, and Houston.